Manchester City’s Sergio Aguero gave the Citizens the lead in the 17th minute of their match against Burnley this afternoon. 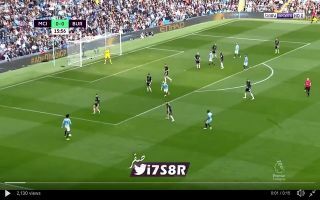 Leroy Sane and David Silva were excellent in the build-up to the goal, both men exchanged passes with each other dazzling the Burnley defence. Midfield maestro Silva played the ball across the box into the path of Aguero who fired home with a clean strike. Pep Guardiola’s men are definitely looking to capitalise on the draw between Chelsea and Manchester United earlier today by putting in a stellar performance. Guardiola’s men are hoping to defend their Premier League title this season.